The Bald Hills District, was formed on June 26, 1907. 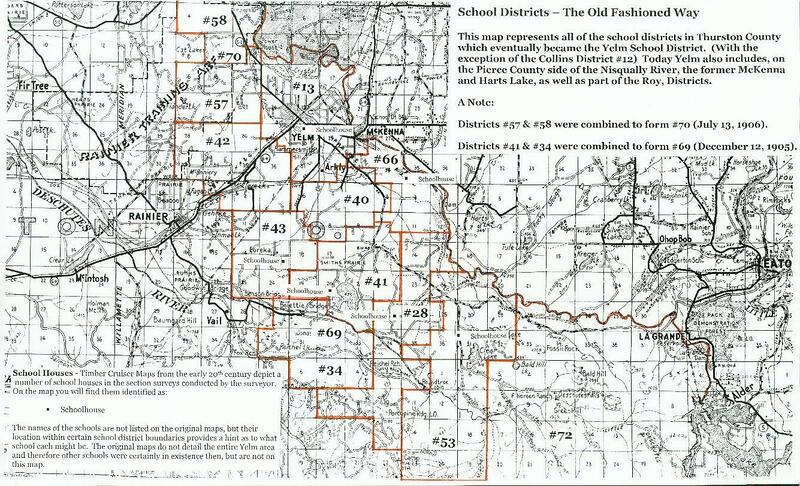 This district was formed when the old Deschutes District was broken up into several separate school systems. 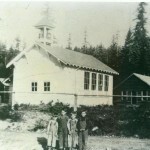 According to The Story of Yelm the first teacher there was Ethel Ross [Longmire]. Introduction: In 1995, Patty Kinney interviewed a former student, Antone Johnson, at the Bald Hills school. Portions of her story are contained below. Through his memory and pictures we catch a glimpse of that school and life in the Bald Hills in the early part of the 20th century. The Bald Hills School house is no longer standing. In fact, it has been nearly 80 years since children bustled in the doors short of breath, but octogenarian Antone Johnson remembers his schooling there as if it were yesterday. According to Johnson, who now resides in Shelton, some old mobile homes now stand where he, his brother, and other children learned the three R’s. 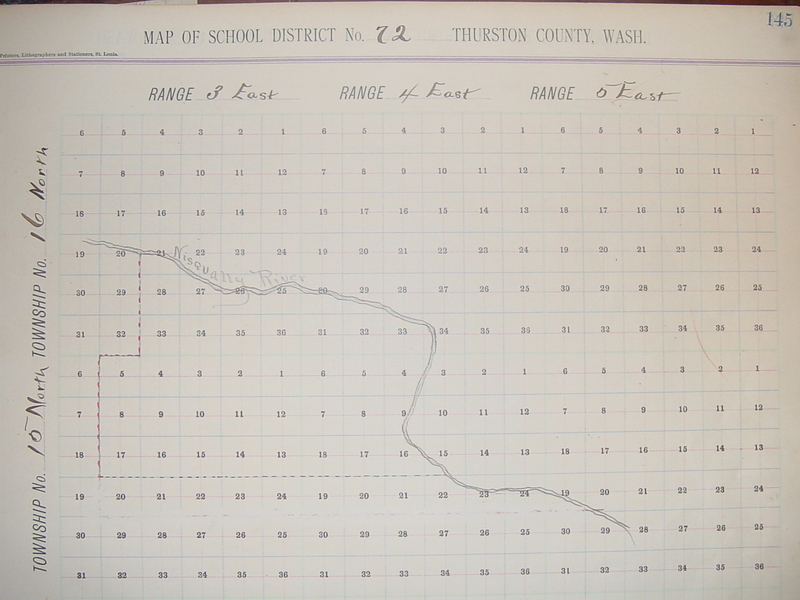 The school was located near the end of Johnson Road on the left as one heads toward Deschutes Falls. Johnson flips through impeccably organized hand-penned notes, pausing to finger an aged black-and-white photo. Seventeen classmates from the three schools are pictured. One of the girls in the photo was classmate Ernestine Jungworst. Johnson remembers he and Jungworst were babies at the same time and he was always told that they were put in a crib together as infants. Other pictured in the photo included Mason Longmire, Ted Shearer, Johnny Reichel, Lavina McVity, Jimmy Cook, and Walter Roundtree. Johnson believes he must have been ten years old at the time the photo was taken. Johnson recalled that a “Franklin” with a round hood hauled the kids to school from up on the Bald Hills. Miss Ever[h]am was the teacher. Johnson also remembered that it was at school where he first saw a girl. “Those Beamis girls, Esther, Edith and Madeline. I’d never seen a girl except my sister. I was fascinated,” exclaimed Johnson. Johnson has many memories of growing up in the Bald Hills. He laughed as he recalled the time Martin Sorenson and another man went down to Mitchell Creek and picked up a man who had died. “There was a dance going on near Clear Lake, about a mile past the present Clearwood entrance. They wanted to stop there real bad at the dance so Sorenson piled the body in the wagon and, do you know, they went to the dance and got drunk, corpse and all. I guess that’s one way to do a wake,” chuckled Johnson. Johnson’s mother Mary was born in Pennsylvania, his father Rudolph, in Denmark. “My grandfather came out here to hunt. He was acquainted with someone out here around 1903 or 1904. I don’t know when Dad bought the place out here, probably shortly before I was born. My mother came out on the train. She was a housekeeper and nanny for the Lord family in Olympia. She was 15 years old. In those days it took from dawn to dusk, all day, to travel into Yelm and back from the Bald Hills with a horse and buggy. Johnson recollected there was a man named Bald who lived close to the school. Mrs. Bald divorced her first and second husband and married a third. “They all three stayed on and worked together,” Johnson said with a grin. 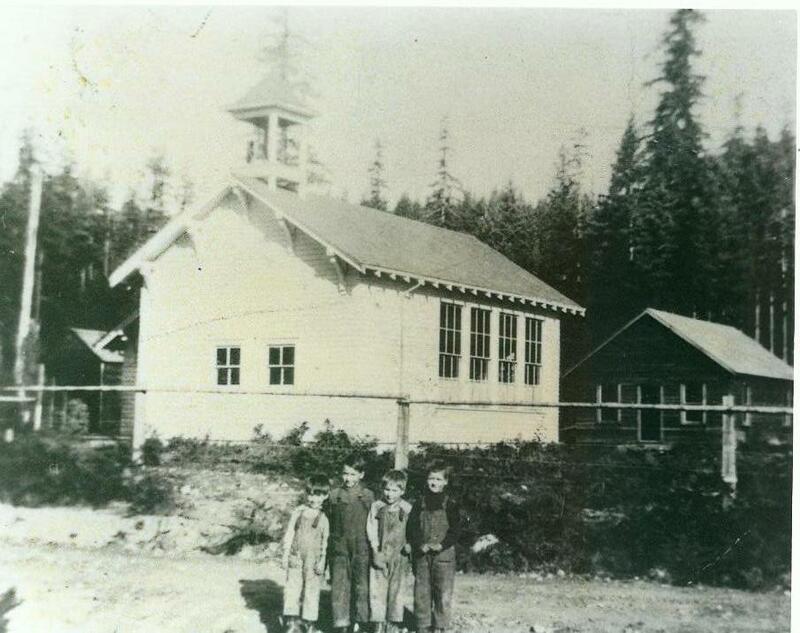 When Lucile Taylor looked out at her class in the fall of 1916 it was easy to take roll. The children in the room that morning numbered six. From the Johnson family there was eight year old Antone and six year old Andrew. Next to them were the Roundtrees, Donald (7), Walter (9), Eva (12) and Cora (16.) Interestingly, the records for that year note that there were only 8 seats available. Antone’s father, Rudolph served with Frnak Noreen on the board of directors. The directors must have participated in the discussions concerning the formation of a new Lackamas District. The Bald Hills, Longmire, and Morehead districts would be combined into district #305. The Roundtrees and Johnsons would now be “trucked” to their new school.